This one was given to me by Paul who sells hops for Willamette Valley Hops. Gargamel had been in his cellar for some time and then sat in mine for several months before being opened as part of my October Epic Beer Month. This beer has a nice amber color with a very thin white head that disappears almost immediately. The aroma has some dark fruit and a nice earthy funk. Taste has probably mellowed out quite a bit from when it was originally bottled as it has been at least 2 years. 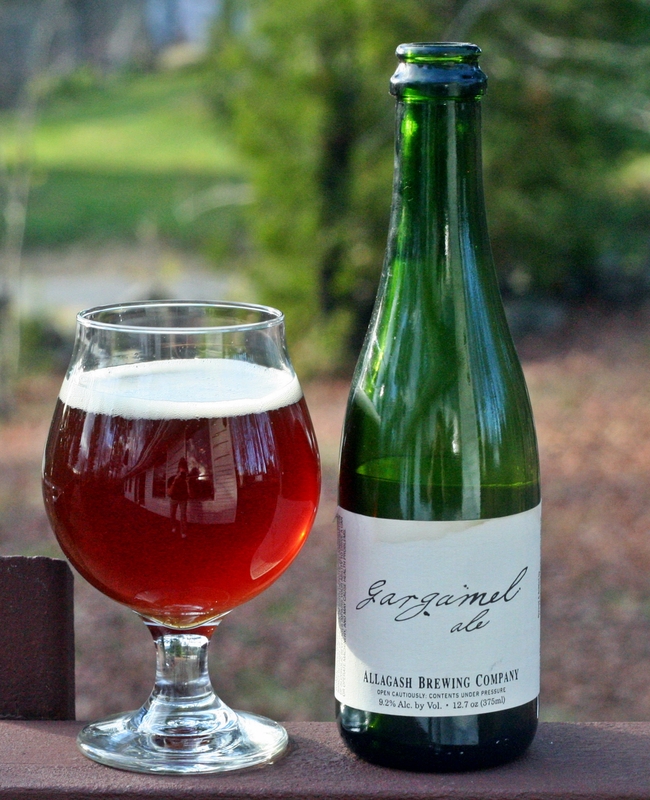 Still has some oak but the raspberries mentioned in Allagash’s description are almost entirely lost. Really complex mix of flavors and very tasty. Would have loved to have tried this one when it was fresh so I had a point of comparison with this bottle but it is still tasting great. If you have a bottle in your cellar you may want to give it a try. Brewers Description: Gargamel, a Belgian Style sour ale, is the first offering in our limited release 375 ml series. Our brewers used a blend of American 2-row barley Malt, Raw and Malted wheat and selected caramel malt to brew this beer. After primary fermentation the beer was inoculated with our house Brettanomyces aged in French Oak wine barrels with a generous amount of local raspberries for over 18 months. Gargamel’s aroma is full of un-ripened raspberry, vanilla and citrus notes. This medium bodied beer has hints of biscuit and graham cracker with a clean, fruity and refreshingly tart finish.